Darjeeling is a happening tourist destination in West Bengal since the time British connected it with the Darjeeling Himalayan Railway. 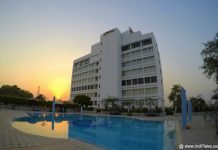 Choosing a nice place to stay in Darjeeling can be challenging as you have all kinds of options. 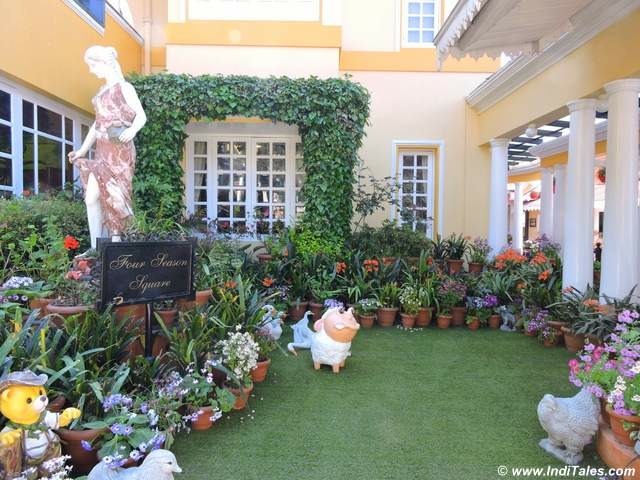 We chose to stay at Mayfair Darjeeling as we had already experienced their hospitality at Mayfair Gangtok. And we’re happy with the aura of divinity and the aesthetic taste of their property. We were even happier when we checked out of Mayfair Darjeeling. 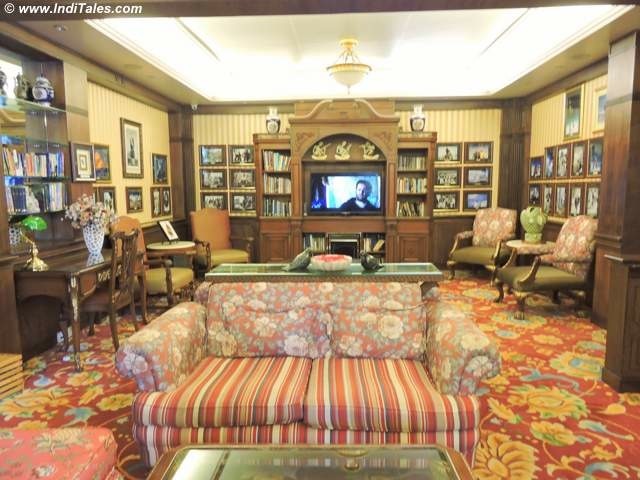 The bibliophile in me could not have been happier when I saw a library at Mayfair Darjeeling inspired by and dedicated to the Sherpa Tenzing Norgay. Tenzing, as we know, was one of the first persons to climb the Mount Everest. His Samadhi is not too far from the hotel on the grounds of Himalayan Mountaineering Institute. 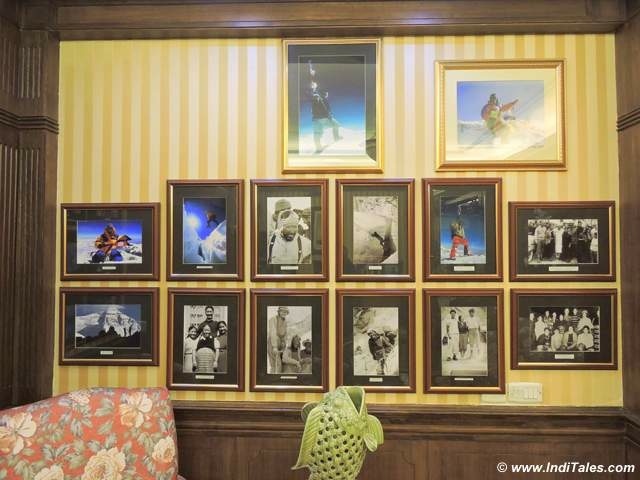 The beautifully designed library has walls full of Sherpa Tenzing’s pictures. If you spend some time, you can feel his journey through these pictures. There is a frame with newspapers cuttings talking about his unprecedented journey. Another frame contains a stone from Mount Everest that was gifted by his family to the Sh Dilip Ray, owner of Mayfair Darjeeling. 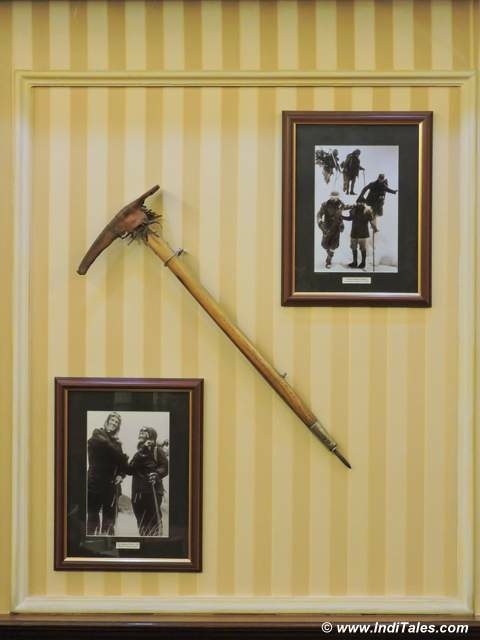 There is an ice axe in another frame. There are films on mountaineering that you can sit and watch right there with your friends or take them to watch in the comfort of your room. I loved the feel of this room, that is so connected to the legendary son of the soil. 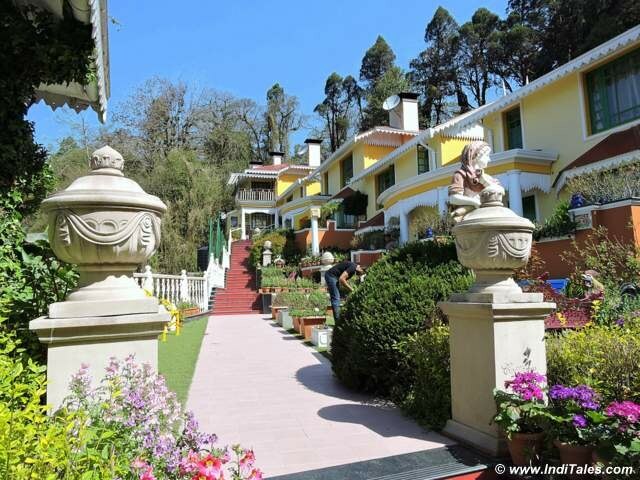 The main building of Mayfair Darjeeling used to be the summer house of Maharaja of Nazargunj. If like me you are wondering where is this Nazargunj – well it would lie in the neighboring state of Bihar. 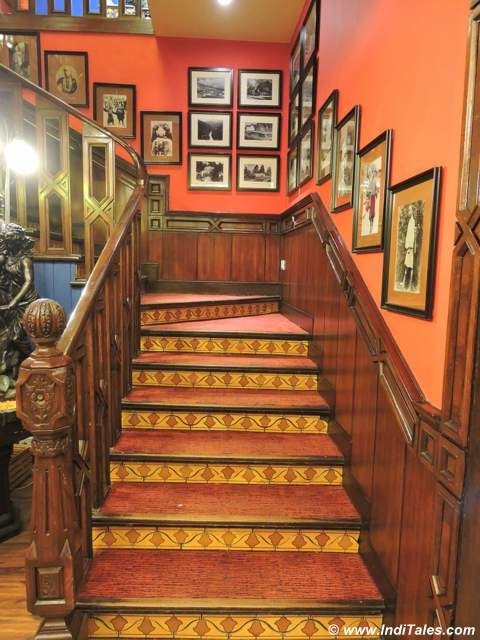 The building still had a very English style architecture and décor. Linen, curtains, fireplaces, ample use of wood and walls full of photo frames take you back to the era when it would have been constructed. It does not take much to feel like a royal guest. There is a certain charm that the old world building offer that is simply not replicable. The gardens are impeccably maintained with bright sculptures to add the spark. 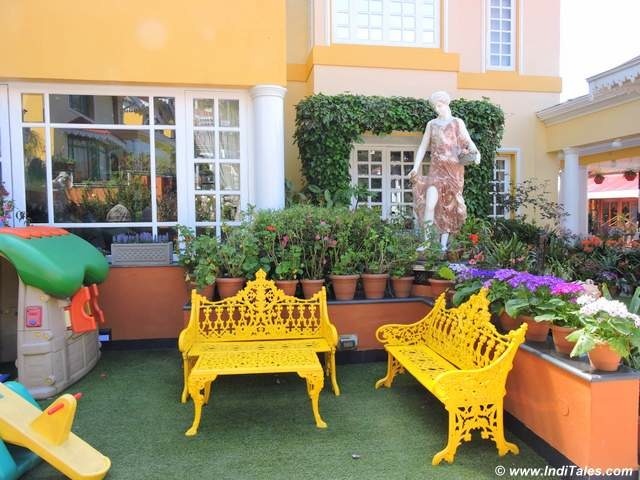 I remember when I posted the first picture of Mayfair Darjeeling on my social media – everyone wanted to know about this bright looking place. 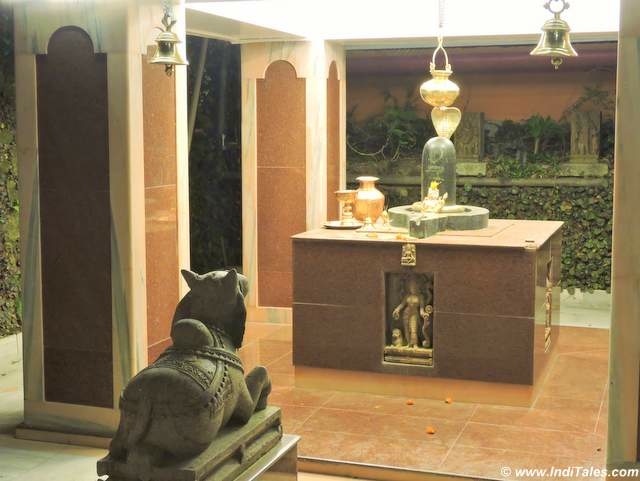 As you go down the path leading to the hotel, the first thing you see is a temple with Shivalinga in black stone. As you reach the landing, you will meet the idol of Ganesha in Saffron color. After you have met the father and son, you get the first real glimpse of the property. 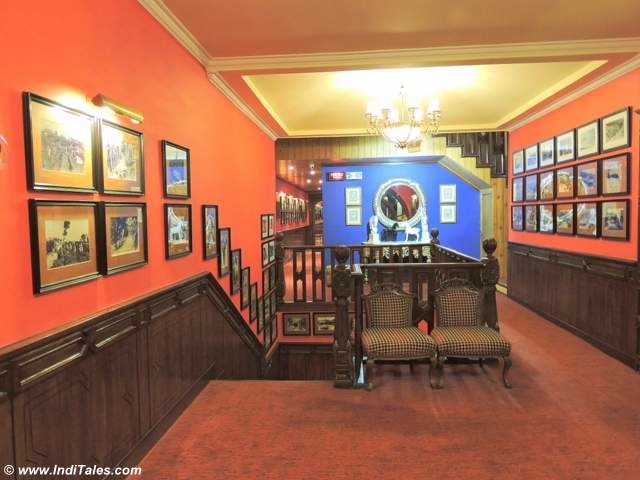 I was very impressed with the black and white pictures of Darjeeling on a bright pink / red wall. It was like a walk through the history of Darjeeling. Later when I was talking to the general manager of the hotel, he told me that old pictures of Darjeeling can be easily sourced from the Das studios. 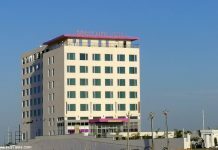 The studio that is hardly a stone throw away distance from the hotel. It maintains a catalog of old Darjeeling pictures and anyone can buy them for a small price. I wonder if any other town/city in India has a similar access to old archives. 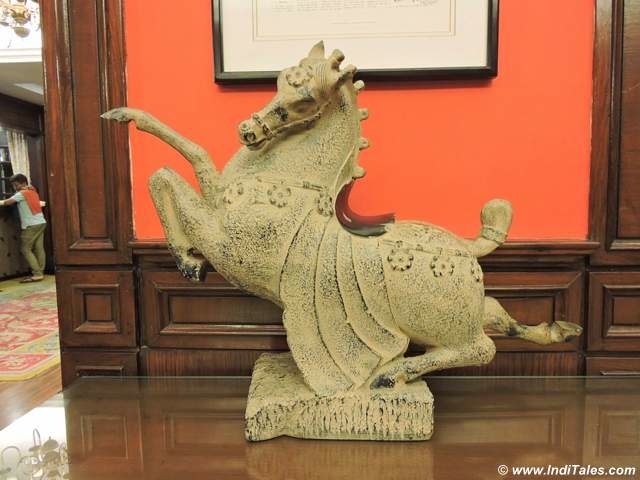 There are stone sculptures from Odisha here and there. The pots full of seasonal flowers add their own vibrancy to the environment. 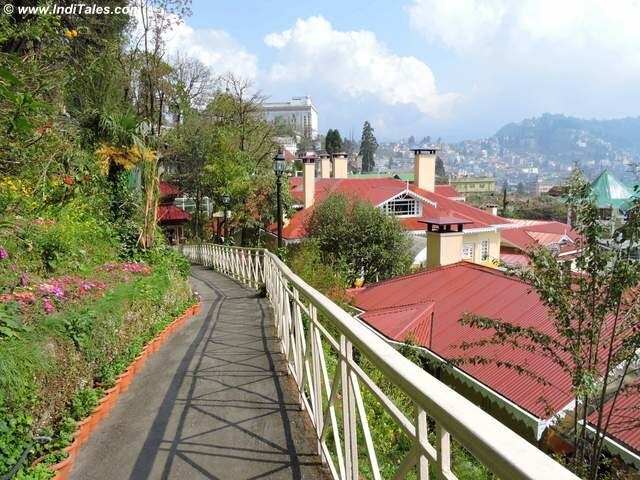 Located at one end of the famous mall road of Darjeeling, it is perfectly suited to explore Darjeeling on foot. Except for going to the famed sunrise point, we explored the whole of Darjeeling on foot. We could do this primarily because of the central location of Mayfair Darjeeling. On day 1 we walked towards the Darjeeling Zoo and Himalayan Mountaineering Institute, passing by the Raj Bhavan. Next day we walked to the Darjeeling railway station to take a ride on the heritage train. In the evening we walked to the Mahakal temple for another view of the valleys around Darjeeling. Mall road was like backyard and we took many walks during the day, to enjoy the coffee houses, to buy Darjeeling tea or just stroll along with million other tourists. Service and food are good as we expect from a high-end hotel. The staff is friendly. You must sit out in their gardens or verandahs at sunset time for a lovely view. Of course my favorite time – mornings is also a good time to sit out when the air is so crisp that you want to inhale it all. I would be happy to go back to Mayfair Darjeeling for exploring some more of the charming hill town of Darjeeling. 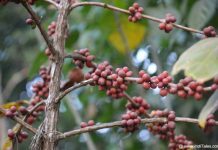 Recommend you to read following travel blog posts on things to do in Darjeeling. Darjeeling Himalayan Railway – A Living Dream. Padmaja Naidu Himalayan Zoological Park – A Photo Essay. Nice one. Though I am not sure if I would wander out after staying here :D. It is a destination in itself. As a bibliophile, as a heritage junkie – have to agree with you. It was a lovely place to stay. we did whole of Darjeeling walking from Mayfair. Darjeeling is my favorite place. This hotel reminds me of mid 90’s bollywood movies. Great place and great hotel. I also liked Darjeeling a lot, just wish it was not so crowded. How fascinating that Manicured Gardens inside. I’m just wondering, what so special about Darjeeling tea compared with other tea? 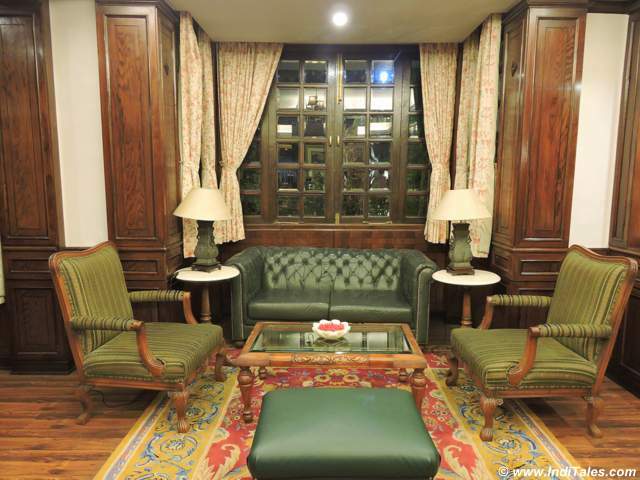 I admit Darjeeling hotel has full of charm. Yes, Annika, Darjeeling is Charming. I guess tea takes its flavor from the land it grows on, so Darjeeling tea has its own flavor and aroma just like any other tea.